Kathy is a Vermont award-winning artist and illustrator with a love for the outdoors. 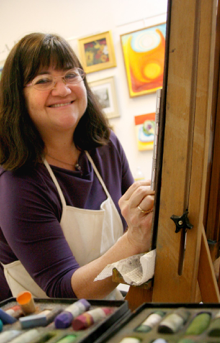 Her friendly, colorful style is evident in her pastels of landscapes and other favorite subjects. Kathy has been painting for many years, whether it is a mural on children’s bedroom walls, stage sets, or in homes across the country. She has a studio in White River Junction at the Tip Top Media and Arts building and is a freelance graphic designer. “I have always loved art in all its forms. My painting is done usually in the studio. I take photos or sketch landscapes or any particular subject that strikes me and bring those inspirational beginnings to the studio and go from there. I often ‘fall in love’ with an idea for a painting, then I choose my palette depending on how I want to use color for the piece and work on lightly sanded color paper, which holds the pastel best.